Are you looking for a simple, natural carpet cleaning solution? One of the best natural carpet cleaning solutions to try in Birmingham, AL is lemons and lemon juice. 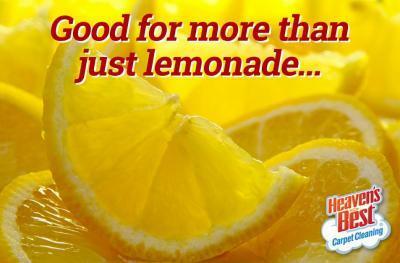 Lemons are natural and inexpensive and you may already have some in your fridge. Lemons smell great and their acidic nature can break down many food stains. In order to use lemon juice as a cleaner, you need to mix the juice with equal parts water and pour into a spray bottle. Before spraying it on your carpet, you should try to blot up the stain with a clean towel or paper towels. After blotting up as much of the stain as possible, spray the lemon solution on it. If you have light carpet, you should test the spray in an inconspicuous spot first. After applying the lemon solution to the affected spot, let it sit for a few minutes. Then use a sponge or cloth and gently blot the area. The stain should come out very easily. If you have a really tough stain, you can add a couple drops of dish detergent to the lemon water mixture. Shake the bottle well to mix the ingredients. Apply to the stain and then blot again. Lemon juice is a very good Green cleaning product that can be found in most households. It is also a natural deodorizer, so it will leave your home smelling fresh. In case there are stains you cannot deal with, call Heaven’s Best Carpet & Upholstery Cleaning at (205) 618-9150. We have even better professional cleaning products that will clean most any stains and they also have them in lemon and citrus scents. Along with every carpet cleaning, we offer our FREE CITRUS DEODORIZER. We can bring your carpets back to life and leave your home smelling fresh and clean. If you don’t have time to try this lemon carpet cleaning solution in Birmingham, AL, Heaven’s Best Carpet Cleaning is here to help. Contact us today!